EDGAR Vidale, Trinidad and Tobago's coach, was extremely happy with his team's 5-0 drubbing of Grenada in their opening Group A game of the Shell Caribbean Cup played at the National Stadium on Sunday night. He described the victory as "great and one the whole country will be proud of." Vidale is serving as coach for the Shell Cup tournament in absence of appointed national coach Alvin Corneal who had replaced the dismissed Everald "Gally" Cummings. Trinidad and Tobago surprised everyone with their grand display of positive attacking football, and the margin of victory was never imagined especially going into the tournament without six of their best footballers. All their goalgetters in Philbert Jones, Leonson Lewis, Dwight Yorke, Russell Latapy and Brian Haynes plus overlapping left wing Marvin Faustin were unavailable through overseas committments or injury. But quiet and unassuming Vidale was always optimistic of producing high quality soccer, something that Trinidad and Tobago has been doing consistently for over two decades. Leading up to the finals the coach had said: "We are coming to win the Cup again and continue the work to prove that we are the best team in the Caribbean." In an unbelieving display of scintillating attacking football, Trinidad and Tobago crushed last year's runners-up in a match billed as the replay of last year's final. An elated Vidale said: "We played to according to the team plan. The boys stuck to the strategy we thought would be good enough to beat Grenada. I had seen them against Suriname and was able to devise a plan to counter their style. The result makes me proud of the boys. They kept their composure in the first half and concentrated well throughout the session." 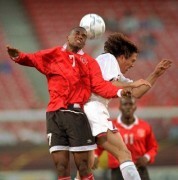 Trinidad and Tobago's national captain Clayton Morris described the victory as "the start of another journey." "We tried last year to reach the World Cup finals but just didn't do it," he said. practice as they could get." Grenada's coach Ashley "Ram" Folkes was clearly disappointed and blamed his goalkeeper Godfrey Williams for the team's disastrous showing. "I am very disappointed and the goalkeeper is to take some of the blame for the defeat. Also the heavyness of the field contributed to our downfall but I don't want to take anything away from Trinidad and Tobago. They are an organised and fit team. They outplayed us." Grenada must beat Jamaica Tuesday night if they are to stay in the competition. A defeat would see them packing their bags for an early flight home on Friday. Winners of each group will clash in the grand finale on Sunday, July 29 while the third-place play-off comes off on July 28 at the Arima Municipal Stadium.